Marvelous news! Our craftsmen have just introduced a new Castle Skin sure to grant you incredible bonuses - the Smolderstone Keep! Apart from its unique appearance, the Smolderstone Keep shall grant a Defense Bonus to your Castle! 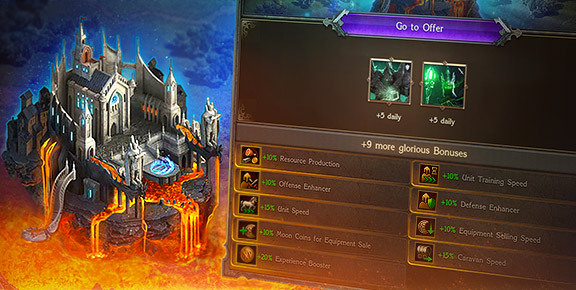 It shall also provide you with new Units every day as well as numerous other bonuses, such as Resource Production Boosts, improved Unit statistics, increased Experience Points, and much more! You can see the full list of bonuses by clicking on this Castle Skin. But note: the duration of this Temporary Skin is limited. You can choose between 1-day and 7-day versions. Once it has expired, your previously applied Castle Skin shall be displayed. Remember: Temporary Castle Skins are only available as part of your Special Offers and cannot be purchased at the Black Market. So keep an eye out, my Lord, and seize new Castle Skins while you can!